We updated you on the happenings about GLOVO in August this year, more particularly on the celebration of our 5th Anniversary. Since then much has been done and as loyal partners, we need to inform you on the progress and developments that had taken place spinning from the latter part of August this year till now. Glory and honour be to the Most High God for his constant support and direction in circumstances where the human mind could not find solutions. He paved way for Management and through thick and thin a lot of progress has been recorded. As part of her annual visit to Africa, and Ghana in particular, the Executive Director of Morningstar Family Ministries visited GLOVO in connection with her Personal Secretary, Crystal. 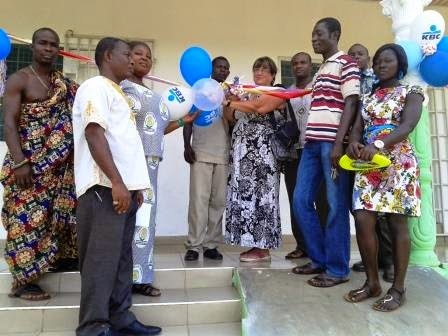 As part of their working schedules, they furnished the newly constructed GLOVO clinic at the GLOVO Village. In fact, the clinic is fully stocked with drugs, equipment and gadgets which are needed in every modern clinic. 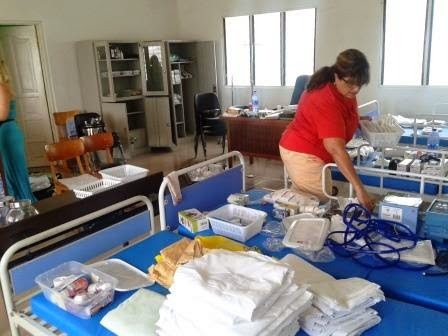 Management in collaboration with the Municipal Health Directorate is in the process of getting a hardworking trained nurse to manage the facility. In the interim, the clinic will operate as a Sick Bay and will later be upgraded to a standard clinic by the government. Dr. Carmen Ferber visited the Maristan Home to check on the well being of the kids and the caregivers. She was impressed about what she saw and pledged to raise support to build more of such facilities to accommodate homeless kids and orphans. The Director of GLOVO led Dr. Ferber to visit some of the GLOVO kids in the remote areas where she made some donations to the kids. Some of the villages visited include Domokyi, Brahabekum, Kwasikum, Fante Bawjiase, Otwekrom to mention but a few. 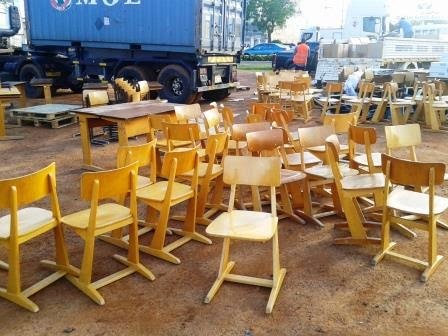 Another historic event that took place was the clearance from the Tema Port a consignment of some school furniture and computers and accessories to set up a computer lab for the Academy. However, there is no permanent room where these computers can be set up. It is therefore a matter of urgency for management to make this passionate appeal to all friends of GLOVO to come to our aid to build a facility to enable us set up the lab so that the purpose for sending them will be realised. GLOVO chalked another success in the period under review. We organised a wonderful GLOVO Kids’ Camp, first of its kind in the annals of the organisation. All the GLOVO kids, far and near were invited to join their friends at the Maristan Home for the celebration. Management in connection with volunteers designed memorable programmes which included fun games, clean up exercises, colour work, health talk, learning German language, weaving and others. The programme lasted for four days. Management wishes to make this programme an annual event and will include non GLOVO kids to also participate and benefit from the good things the programme offers. Mobilisation, feeding and lodging come with a cost and we therefore open our doors for donations and sponsorship of the camp so as to make it bigger next year. The organisation hosted one of its best friends and donors, Judith, in September this year. In fact, words cannot describe our gratitude to Judith for the selfless moves she has taken to support GLOVO in diverse ways to ensure that the organisation expands rapidly. She was like an Administrative Secretary to the Director of GLOVO and suggested many important things to help develop GLOVO. She was very much impressed about the development she saw at GLOVO and pledged to strive to get donors to support GLOVO project. She and the Director of GLOVO were interviewed on Crystal TV in Ghana on the activities of GLOVO and this has really helped in publicising GLOVO nationally and globally. Thomas, the Director of World View, a non-governmental German volunteering organisation, also paid GLOVO a working visit in September to familiarise himself with the activities of GLOVO. A memorandum of understanding was signed between GLOVO and World View on ways of partnership in volunteering services. Thomas was so happy and impressed about GLOVO’s activities and considered it a viable partner in the volunteering work. He pledged to work assiduously to ensuring that his organisation sends volunteers to work for GLOVO in Ghana. After his departure, two volunteers from World View were sent to work for GLOVO. Tommy, we say thank you for considering us a worthy partner. GLOVO Academy re-opened in September after the long vacation to begin a new academic year. Few admissions were made; new teachers were appointed to replace those who have got the opportunity to volunteer in Canada, Tanzania and elsewhere. We also received more volunteers to serve as Teaching Assistants in the school. The school is growing but it faces infrastructural challenges. Two classes were temporarily housed under canopies inside an uncompleted building. It was through the effort of Franzi, a volunteer who is working in the school, that funds were raised to roof the rooms which are now habitable. Franzi is so passionate about her work and wishes to go extra mile to support GLOVO project. Indeed, she is a real team player and we wish other volunteers will emulate her shining example to support their project areas. The school’s Soccer Team emerged overall winners of the Municipal Private Schools’ Soccer Competition where they thrashed their opponent 3-0 to lift the golden trophy at stake. We would be glad if you could donate some sporting kits to our team to boost their training and morale. We cannot end this quarterly report without mentioning anything about the reception of our first ever Welt warts volunteers on 29th August this year. It was all joy when they met at the arrival lounge at the airport. Prior to their coming, GLOVO management organised series of workshops for mentors, Project Supervisors and host families on how to handle the volunteers with care. 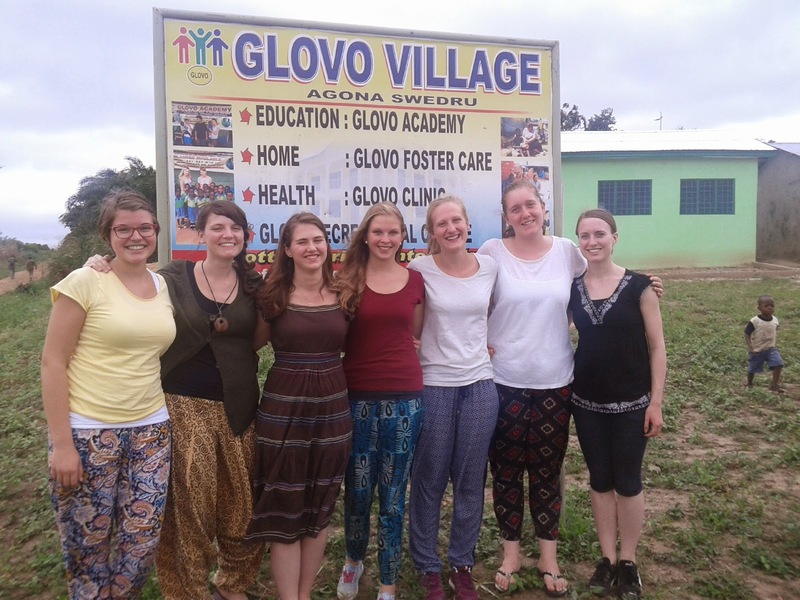 The five GLOVO volunteers received are Marie, Kira, Lena, Sophie and Franzi. 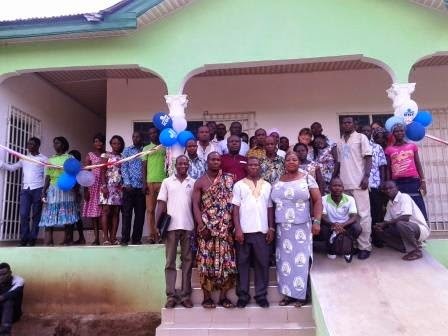 They were given a one-week orientation on different subjects to enable them adapt to the Ghanaian ways of living. The seminar was informative and educative though there could have been some pitfalls. You can also give it a trial and GLOVO will orient you to feel at home and your volunteering experience will be thrilling and cruising. We wish well in this festive season and would be grateful if you could charitably donate something in cash or kind to brighten the faces of these teaming less privileged kids in our care. God bless you! Only Bisping (20) has won more bouts in UFC than St-Pierre's 19 and the Canadian is widely regarded as mixed martial arts' greatest. The rematch is set between UFC welterweight champion Tyron Woodley and the Wonderboy himself, Stephen Thompson. Thank you for writing a very informative post. Power Rangers is an American superhero film directed by Dean Israelite with a screenplay by John Gatins and a story by Matt Sazama and Burk Sharpless and Michele Mulroney and Kieran Mulroney. The film, based on the franchise of the same name, stars Dacre Montgomery, Naomi Scott, RJ Cyler, Becky G, Ludi Lin, Bill Hader, Bryan Cranston and Elizabeth Banks. Shirow has stated that he had always wanted the title of his manga to be "GHOST IN THE SHELL", even in Japan, but his original publishers preferred Kōkaku Kidōtai. He had chosen "Ghost in the Shell" in homage to Arthur Koestler's The Ghost in the Machine, from which he also drew inspiration. The Home of Premium South Asian Entertainment. Choose from 1000s of HD Bollywood & Top Hindi Movies 2017, Music Videos and Audio Tracks to Stream Online. covers and screen protectors. ... Uniq iPhone 6 Plus Phone Case and Mount - Black. , iOS 10, 5.5", 4G LTE, SIM ... Apple iPhone 6s, iOS, 4.7", 4G LTE, SIM Free, 128GB, Gold. Thanks a lot for sharing this with all of us, I like it and we can communicate. Do you need buy app ratings and reviews. To boost app ranking and double app downloads now. : “And for us too. I mean, it's just from the novel and [garbled]. But when you get to this point you say, 'Okay, Annihilation watch 2018the movie's not ultimately about this guy…so what is it about? '” HE: “About the end of the world, about the good old stuff really coming to an end, about being engulfed by waste and annihilation.”. The 70th Primetime Emmy Awards air live Monday, Sept. 17, at 8 p.m. Eastern on NBC. Where can I watch the Emmy Awards online? If you subscribe to a TV provider, you can log in and stream the show at NBC.com/live, or via the NBC app on pretty much any mobile device. The show will also be available on Hulu’s live TV service. “Saturday Night Live” Weekend Update co-hosts Colin Jost and Michael Che. They say they won’t get too political. When is the red carpet so I can watch and judge all the fashion? As usual, E! has the most comprehensive red carpet show — Giuliana Rancic and Jason Kennedy will co-host and interview the celebrities, beginning at 6 p.m. Eastern. Which show has the most nominations? HBO’s “Game of Thrones” is shaping up to have a great night — it returned after a year of ineligibility with 22 nominations, the most of any series. It’s followed by NBC’s “Saturday Night Live” and HBO’s “Westworld,” with 21 each, and Hulu’s “The Handmaid’s Tale” with 20. The UFC originally planned an interim title bout between Nurmagomedov and The Ultimate Fighter: Team Lesnar vs. Team dos Santos welterweight winner Tony Ferguson, but it was canceled on account of the Russian with medical problems associated with his weight cut on weigh-in day.Ferguson finally won the interim title at UFC 216 against Kevin Lee.Ferguson was subsequently expected to meet Nurmagomedov at UFC 223, with the winner being crowned the undisputed champion (since McGregor would be stripped of the name whenever the bout happened ). In turn, it had been scrapped once again (fourth moment ) as Ferguson got hurt, and following several chances to get an opponent, Nurmagomedov finally won the vacant title against Al Iaquinta. This card was marked by an assault on a bus comprising several fighters scheduled to compete in the event (including Nurmagomedov and two teammates), conducted by McGregor and his team. Jussier Formiga was previously scheduled to confront Sergio Pettis in January 2017 at UFC Fight Night: Rodríguez vs. Penn.. However, Formiga pulled from the fight for undisclosed reasons.The pairing was rescheduled for this event. For complete coverage of UFC Fight Night 136, have a look at the UFC Events section of the website. The Blue Corner is MMAjunkie's website place. We do not take it too seriously, and neither should you. Should you come complaining to us that something you read here is not hard-hitting news, expect to have the previous sentence repeated in ALL CAPS. It's, after all, the"largest fight in UFC history." This occurred Saturday at UFC Fight Night 136 at Moscow, where former strawweight champion Joanna Jedrzejczyk was a guest fighter. Right off the bat, first question, she was asked for her forecast of Khabib vs. McGregor, and she gave a neutral reaction. I'm 50/50. I'm a big fan of Conor, and I am a big fan of Khabib. Two distinct styles," Jedrzejczyk explained. "As you saw, I do not predict a battle. I really don't want to forecast the conflicts. Folks can do this. They can predict my fights, but I never do this. Anything and everything could happen in the fight. This is surely the conflict of, what, like the century? In MMA. So I can not wait to see two great warriors fighting each other. I am 50/50. Glovo. Picture Window theme. Theme images by piskunov. Powered by Blogger.